At Global Surveying Consultants, Inc., we’re accountable to our clients. Whether you are planning on building a fence or subdividing property, we have a diversified and dedicated team of associates to assist you. We recognize that customers have their own preferred methods of operation. Our depth of experience, technology and equipment enables us to customize our services for each client to ensure that requirements are achieved in the best possible manner. 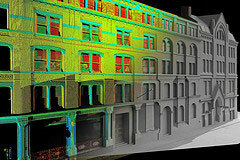 3D Laser Scanning is on the cutting edge of today’s surveying technology. This technology creates a virtual image of a real world scene using millions of precise laser measurements. We can then take precise measurements on any object within the virtual image. This allows planners on the conceptual level, and engineers, architects and contractors on the design level, to create accurate 3D models of the existing conditions while overlaying the proposed design. At Global Surveying Consultants, we work closely with highly experienced engineering consultants that we can bring in on projects as needed, allowing engineering work when required, but enabling us to minimize overall costs for our clients. Our engineering consultants can focus on everything from conceptual design through final design and specification packages, in order to maximize the benefits of every dollar expended. Their depth of experience includes site development, grading, drainage and layout, storm water handling, water distribution, sanitary sewer design, roadway design, and subdivision layout and design, etc. 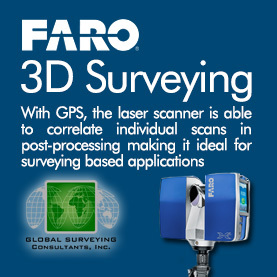 Meet the 3D Surveying Consultants team of professionals.